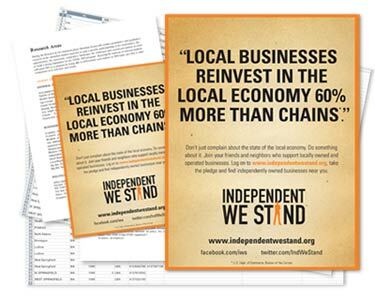 Independent We Stand is committed to providing locally owned businesses and their potential customers with resources to help them understand the positive impacts of "buying independent", and give them useful tools to help spread the word. Here you will find a collection of articles, studies and website links that can help you understand and promote the benefits of "buying independent". If you have any suggestions to add to this collection, please don’t hesitate to email us at info@independentwestand.org. Just think. If every family in the country spent an extra $10 a month with a locally-owned, independent business instead of a national chain, over $9.3 billion would be directly returned to local economies. That means better schools, better roads, more support for police, fire and rescue departments and stronger local economies. Find out what kind of economic impact you could make by doing the same in your metro area. Here you’ll find information about Independent We Stand including press releases, fact sheets and Q&As and more. To learn more about the Independent We Stand movement, arrange interviews or for other story ideas, please email us at media@independentwestand.org.